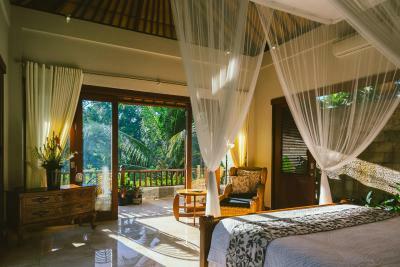 Lock in a great price for Kano Sari Ubud Villas – rated 9.8 by recent guests! Breakfast was excellent with 4 choices everyday. Staff was superb. Jepun Villa is beautiful. Can't imagine my great good luck in staying here. The staff was extremely friendly and went above and beyond to make our stay as comfortable and enjoyable as possible. They are very knowledgeable about some hidden jems in the area and were able to give us great, tailored recommendations based on our interests. The property itself was beautiful and pristine. Very nice staff, great facilities, clean. Loved the customised breakfast. Extremely peaceful location and clear attention to detail with their decor! The staff and accommodation were all faultless. Nothing was too much trouble. The attention to detail was great. They provided lots of little extras, like a mobile phone, earplugs and a torch. The food was delicious- the best we had in Ubud. Will definitely return. Fantastic customer service. Beautiful decor and layout. Room was fantastically comfortable. Staff on site were extremely helpful and accommodating. Highly recommended!!! First of all everything about this place is amazing from location to staff. The rooms are beautifully decorated and the place has great facilities. We will definitely come back here. The extra details like quality shampoo and conditioner. So much to like. The botanical setting, the spacious rooms, the inviting pool, the delicious breakfast, the local food (be sure to have lunch or dinner at the Villa), the outstanding service, the friendly staff. The ambience on the whole was relaxing, friendly, professional and efficient. My daughter and I felt totally spoilt and relaxed after our visit and are trying to find an excuse to return. Kano Sari Ubud Villas This rating is a reflection of how the property compares to the industry standard when it comes to price, facilities and services available. It's based on a self-evaluation by the property. Use this rating to help choose your stay! One of our best sellers in Ubud! Located just in a tranquil area in Ubud, Kano Sari Ubud Villas offer a great getaway with an outdoor pool, free WiFi access and free on-site parking for guests who drive. 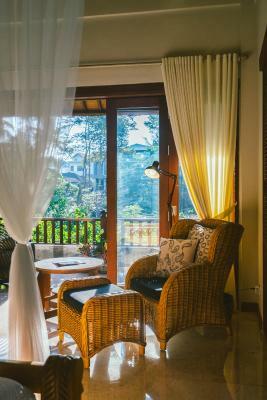 It takes a 5-minute drive from the property to Ubud Maket and Ubud Royal Palace. Getting to Ubud's Sacred Monkey Forest will take around a 10-minute drive. Bali Denpasar International Airport is located around 18 mi away. The large rooms is fitted with air conditioning, a mini-bar and tea/coffee making facilities. Each room has a seating area and a private bathroom with a hairdryer and free amenities. Extras include a dressing area and a safety deposit box. At Kano Sari Ubud Villas you will find a garden, barbecue facilities and a terrace. Other facilities offered at the property include a shared lounge. The friendly staff can also help arrange shuttle service, laundry requests as well as, organize airport transfer service at additional charges. As for dining option, guests can explore the surrounding area to find many restaurants. Wild Ginger Restaurant serving an array of local Balinese dishes can be found a 5-minute walk away. 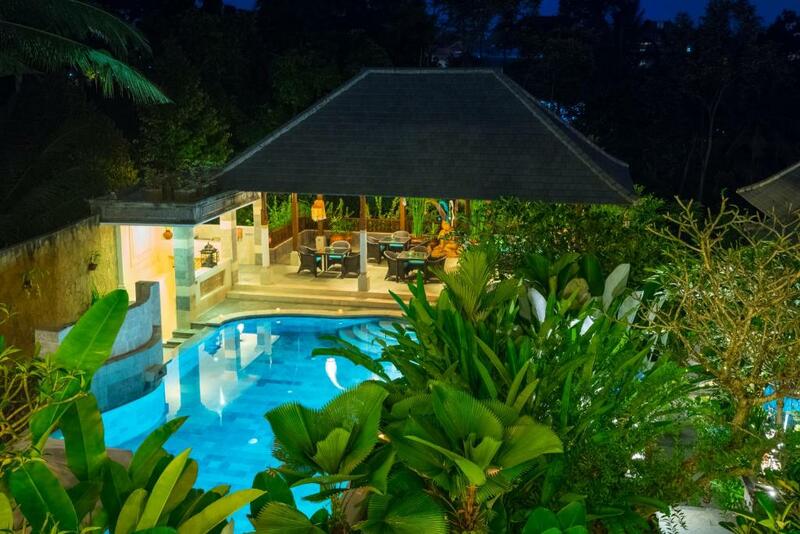 뀐 Located in the top-rated area in Ubud, this property has an excellent location score of 9.4! 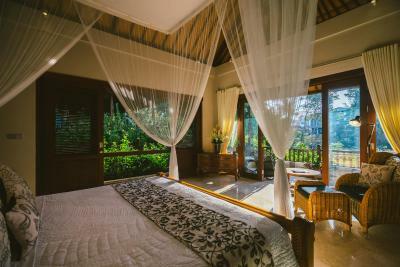 When would you like to stay at Kano Sari Ubud Villas? Located in the main building of the property this double or twin room overlooks the pool. The room is fitted with a large wardrobe, custom-made furnitures and a large private bathroom with shower facility. Guests can enjoy a relaxing afternoon in the terrace. This air-conditioned double or twin room offers views of the property's terraced gardens and the Jero Gadung River. It is fitted with an extra large double bed which can be transformed into 2 large single beds, a dressing room, and a large private bathroom with bath and shower facilities. This spacious double or twin room offers a quiet sanctuary which overlooks the Jero Gadung River. it is fitted with an extra large double bed which can be transformed into 2 large single beds, a dressing room, and a large private bathroom with bath and shower facilities. Overlooking the pool and boasting two private courtyard gardens, this spacious double room is fitted with extra large four-poster double bed. It is also fitted with custom-made furniture, small fridge, coffee/tea making facilities and an private bathroom featuring bath and shower facilities. This spacious suite offers a private patio overlooking the river gorge. It is also fitted with a living area featuring a daybed, flat-screen TV, which can also be turned into a second bedroom. The private bathroom has bath and shower facilities. Small fridge, tea/coffee making facilities, fresh towels and linen are also provided in this room. Guests can enjoy a relaxing afternoon on the balcony. This double room features a balcony, view and electric kettle. Built high on the bank of the Jero Gadung river, Kano Sari is a luxurious private villa in the centre of Ubud, with five uniquely designed suites that can be booked individually or as a whole (for family and groups). As well as a beautiful swimming pool and outdoor dining pavilion, set in a glorious tropical gardens,Kano Sari also boasts lovely spaces overlooking the river, perfect for yoga, massage or just relaxing with a good book. All of the Kano Sari suites are individually designed and decorated. The very spacious rooms are light and airy, each with its own private outdoor terrace. The luxury marble bathrooms are generously appointed with rain showers, premium toiletries, hairdryer, super-sized towels and a wardrobe with a digital security box. 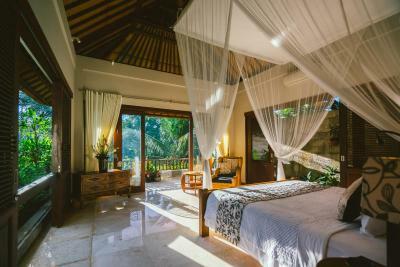 The air-conditioned bedrooms feature custom designed handcrafted furniture, fine Balinese linens and soft furnishings, reading lights and draped mosquito nets. Your suite also comes fully equipped with a bar fridge, tea and coffee making facilities, wine glasses and unlimited filtered drinking water. House Rules Kano Sari Ubud Villas takes special requests – add in the next step! Kano Sari Ubud Villas accepts these cards and reserves the right to temporarily hold an amount prior to arrival. Please note that children under 12 years old cannot be accommodated unless the whole villa is booked. Please inform Kano Sari Ubud Villas of your expected arrival time in advance. You can use the Special Requests box when booking, or contact the property directly using the contact details in your confirmation. Service at its best. Amazing place, location and the nicest people I have ever met looking after out wellbeing. The place has god only 6 rooms/ villas so its super quiet and perfect for a relaxing time out. Highly recommend! And superb balinese massage on site which was one if the best I ever had. Pool water temperature is a little cold and is too deep for children. Great location (a little bit away from main street so quiet) with friendly staff. Breakfast was great. Nice clean suite room. Massage was great. Monkey forest is 20 minutes walk. Thought this is real Bali compared to Kuta area. Overall outstanding experience! Amazing house and garden, only six rooms so feels very home-like. The staff were absolutely and genuinely fantastic. The owner was amazingly helpful. Kano sari has been designed so week and sophisticatedly furnished. They charged my card before I arrived and they beds weren’t separated before we arrived. They did however separate them with no issues. It is like an oasis. So quiet yet near to centre. Nothing too much trouble for staff. Owner comes to chat and listens to any improvements you think would help. If I ever go back to Bali it will be here. No gymnasium at the place, and a little cozy. It was a great experience and we really enjoyed our stay at Kano Sari. Walking distance to the city center and located in a quiet, peaceful, beautiful environment. The staff provides exceptional service here. The setting is very nice in the forest. The staff are unbelievably hospitable. The beds are comfortable and big. Everything is perfectly clean. Wonderful top class, exclusive property with a handful of rooms/villas all serviced in an exclusive way. Great hospitality. Wonderful service and food. Very quiet. Lovely pool. 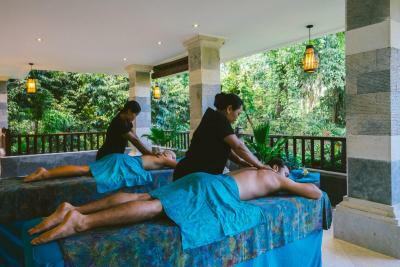 Great offerings for additional services for experiencing the Ubud reality!!! They were really friendly and warm at Kano Sari. Very tastefully decorated. Would have loved to have had the time to speak to the owners who we've heard are wonderful people. They even did up a nice honeymoon decoration for us. Not that I think of. The staff are hands down the best. All of them were so nice and helpful. Foods are amazing, the location is pretty good, and the general ambience of the vila is just chilling and peaceful. I will definitely stay at Kano Sari again when I go back to Bali. Just one thing, if you are a light sleeper, then the nature’s sounds like crickets chirping or neighbors’ dogs barking can be a little bit bothering, but it’s a normal thing in anywhere in Ubud, I guess. To sum up, highly recommendable for all types of travelers!